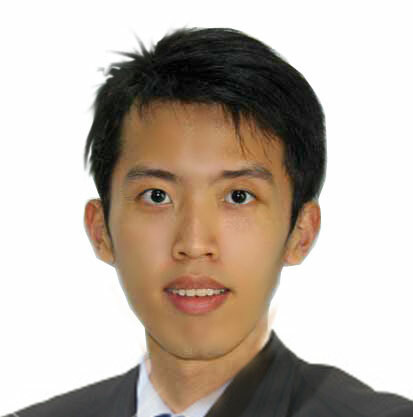 Hi, my name is George Tee, I’m from Singapore and I’ve graduated with a Bachelor of Business Management degree (major in wealth management) in this very year 2010. Now as I looked back, I’m pretty lucky that I am getting my degree eventually because I almost failed my exams when I was in high school. I was totally addicted to gaming and lost interest in my studies. In fact, I nearly dropped out of school when I was around 14 years old. To cut the story short, with a tiny bit of chance, I’ve managed to get into one of the lower ranking pre-universities (or we called it junior college) in our country. My foundations were so poor that when I entered the junior college, I had no idea of the fundamentals of the subjects I learned in high school. If you find any grammatical errors in this website, you will understand what I mean by poor foundation – English language is my second language and it is much worse in the past. In our country, for us to further our studies in the university, we would need to sit for Cambridge exams known as GCE Advanced Level (A-level). It is a recognized international exam that is taken by many students from all over the world. For a student who do not understand a single thing in the ‘A’ level subject would definitely fail the exam. In fact, most people get on average a few Bs. The better ones would definitely score a couple of A’s and the worse ones would score a couple of C’s or D’s or even F’s. I’m not here to brag to you about my grades, but to share with you the importance of using the effective study system. This has nothing to do with intelligence, smart, or even hardworking. The only thing that matters is how you study in a way that makes a difference in your grades. Have I convinced you that using the right effective study system is important? Now I’m sure that the reason that you are reading this page is because you want to use the least amount of effort and get the best grades. To help you get started, I like to help you by sharing with you the secrets I have wrote in my ebook – “Secrets Of Studying”. What Is The Most Important Thing To Do Before You Start To Study? Unlike the other websites where they tell you a lot of stuff about study techniques or how to study effectively, like “study at the same time and same place”, or the “SQ3R” method, these are not the most important factor that will help you get better grades. Yes, SQ3R method may be effective in some way, study at the same time and same place may help you to concentrate or focus better, but all these tips or techniques are not going to help you much if you fail to plan. In fact, all these tips and techniques are going to kill you or make you fail your exams if you follow them blindly. Most students would either think that this is just simply waste of time or they don’t even know how to plan. They think that by start studying immediately would be saving more time instead. Well, that is true if you study one day before your exams. But the truth is if you fail to plan, you plan to fail. That was the first thing I did when I entered junior college. In 2002, I remembered I once told my friends, I planned to get 3 distinctions for my A level subjects. I sit down and spent a few hours planning a grand study plan and this goal was achieved after 2 years. Most of my friends thought I was intelligent, smart or lucky. But think about it, I entered junior college with poor foundation of physics and chemistry (my mathematics was better though), how can I be intelligent, smart or lucky? Deep down inside my heart, I knew that it was all because I planned for it to happen. You can read a simple version of how I planned – 5 Easy Steps To Achieve Awesome Results in 2011. Does that mean if you plan, you will definitely get excellent grades? No! Of course not. There are many stories where you’ve noticed that people are just planning and planning, but when comes to taking ACTION, they begin to run away from it. Try to visualize this, if you are planning to get from destination A to destination B, and you have planned the exact route to destination B. But do you think that you can reach destination B if you start making your way there? If you refuse to work towards getting excellent grades, there’s no way that anyone could help you to achieve it. In my case, I was extremely determined to do whatever it takes to achieve that goal. Next, do you think that if you want to travel from Australia to Japan, and you are taking a ship, how fast can you reach Japan? It’ll probably takes weeks or even months to travel by ship. But if you are to take a plane, you’ll probably reach in a day or two. You see, the vehicle we are using to travel from one place to another is like our learning strategies. However, if we are using a highly effective and proven system to study, it’ll be similar to ‘traveling by a plane’. We’ll be able to shorten our learning process tremendously. Things that we usually take a long time to understand, we are able to cut short the time to learn. And the faster we learn, the faster we’ll achieve our objectives or goals. 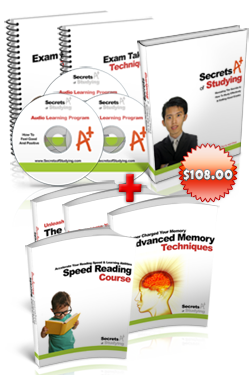 If you are wondering what kind of strategies I’m talking about, you can test your memory strategies by clicking here and see how effective is your current “memory skills”. You also need to develop the 7 Habits of Super Learners where it would help you both your academic but your whole life as well. It will help you to become more productive and learn more in a short span of time. If you would like to find out more about how I plan for my distinctions, the secret studying system I used and my studying strategies and techniques, you can sign up for the newsletter below and you will later reach another page where you will discover more about this studying system I have been using in my student life that helps me achieve good grades without putting much effort. To get the your "how to study" secrets, simply enter your first name and valid email address on the right, and you will watch a video on how to get good grades and receive the secrets in your inbox right away. its high time i prove myself academically……. i need ur hlp…. I am in South Africa, how do I get your material and for how much? hey thanx so much for your advice i really appriciate it.yuh are an ANGEL sent from GOD to change me and to brighten my brain.I did w@ yuh told me to do & its really workin but i have a huge problem, the more i try to read is the more i forget.I am writing my O level examz this june on 08 and i feel lyc iknoe nothing .iam scared that i wont make it i feel like i am an empty vessel.w@ do i do????????????? pliz help me & include mie in your prayerz.Thanx Tee .do yuh mynd if i call yuh Tee & yuh wil call mie kuekue. why do i always end up with a C???? hey i am also of same type. See i also dont what i can do bcoz only 3 days are left for my exams. If u have time then just plan and go ahead wid it. hey i am also of same type. See i also dont what i can do bcoz only 3 days are left for my exams. If u have time then just plan and go ahead wid it. And always get up early in the morning and repeat the thing u want in ur life say the name of ur ambition atleast 20 time. Best of luck dude. I express my sincere gratitude to you. Thank you so much sir, i found your tips very useful and helpful. It has helped me a lot to perform well. I appreciate the good work done by you. keep it up.i believe lots of students are benefited through your guidance.Once again thank you so much……. My daughter is taking her O levels in approx 8 weeks time. She is unable to focus & is generally not motivated due to her discouragement over the years as she has been scoring poorly, as such, it does not give her much incentive to try anymore. I am looking for a one to one personal coach to help achieve a breakthrough with her. i have to give 3 o level papers in oct 2011,all my friendz havealmost finished the course but i haven’t even started yet.i want to download your book but due to some reasons i can’t . Hi!,naina u don’t know how much u hv impacted on my life . may God almighty bless u,Amen. I jst ryt nw open my net nd search fr any “more” secrets or ways…fr studying. . .!! Bt i belve dat diffrnt people hv diffrnt way of acquiring knwledge. . .so xperience nd find ur natural secrts..! I AM A YEAR 9 STUDENT AND I WANT TO STUDY HARD FROM NOW FORB GCSE PLEAAAAAAAAAS HELP ME ! this is enggg…. mug up will not work… try to collect previous question pepars… first of all be prepared with the repeated quentions…study conceptually…. give more time to revise……N best of luck..!!!!! Hi mr goerge lee. Wow you are very briliant person in the way that you understand what the student would could ever want.I was look for someone can give me some advice in long term studying plan I find your advice very helpful. I’m starting to put more effort after I read this today. i am a nursing student and i am having problems with writting definitions and history using references. please help me! dear friend, first of all i appreciate your hard work. second thing is that u should again share your top secrets of getting good results.anyway thanks for your information. please help me because i fine it so difficult to learn.when am reading i dont understand i cant keep any definition in brain,kindly help me out. Dear samuel,the only way for u 2 remember well is 2 re-write what u hav read. Thnx 4 the advice. Ive got sum exams 2 do in january next year so wish me luk!!!!!!!!!!!!!!! I cannot download your book/ buy it. I live in Kenya and it isn;t working:( I really think your book is worth buying. I want to thank you a lot for everything you have taught me and all you showed me. I developed time by time when I bought your Programme. But, there is one thing I still need from you, which I will thank you even more than I can. I need a Self-Motivation Programme. Every time I start Studying I get bored in an hour and loose hope. Please, give me the courage and strength to stand up for what I believe. I really need your help in Mathematics. I study so hard and so much but, I never get higher than a lousy C and I really need a B to get to College because my Life is on the line. wow , what an amazing ideas u gat boy love keep on!!! I just finished my exam and thanks to your Techniques you taught me. I was able to study 3 Whole Chapters in 4 Days Remembering and Recalling and I got someone to ask me Questions and I knew everything. I got my Maths Exam Results and got a B 5 Marks away from an A. Please can you send me some Mathematic Techniques. How to study Mathematics just like you showed me how to study Science and Other Subjects. I feel really angered about myself that I revised so Hard and so Long for that Mathematics Exam but got a ‘C’. 7 hours of work everyday for 1 month= Results. Your profession is Mathematics, do you think you can help me with my Study Skills for Mathematics. Because I have decided if I dont pass my GCSE’s I will give up everything. I am Jim and i am from Brunei. i am a upper sixth student. i am going to sit for my A levels this November. i am taking mathematics, biology, chemistry and EAS (english language AS). i just received my AS oct/nov 2011. sadly, i took only 2 subjects, maths n bio. sadly, i just got C for bio and D for maths. im so depressed. i hope i will get 4A*s for my AS exam this june and my overall A levels grades. i am gonna follow your methods. thank you for sharing your ways of studying! I am short of words. But i must say that ur(Gorge Tee) article have made a great impact in my life today. U jst know the write words 2 use n d write xamples. U just gave me EXACTLY what i need 2 boost my studies n 2 learn effectively. I must say u are really a great person. Plz keep it up. Ur articles is d real facts and i must say dat they are the BEST of all BEST. Thnx………. George 4 ur suggestion. Now after reading ur tips I think I can do much better in my 11th final exam. So thanku once again. I am Mohanavel from India. I want to get A grade but it is too difficult for me. I am studying 11 std with Science group, it is too difficult to study biology and physics. That time I get your advice. I hope that I will get A grade in forthcoming exams. I bought your Programme and I know you got an A for your Maths and I need some Study Strategies for Mathematics because I dont know any good ones. 1) Learn a way to focusing n concentrating on particular stuff. 3) Control your food intake. Thank You for all you have taught me you are the Worlds Gift. Thanks George for all your secrets. Buying your programme was a real good idea. I literally turned my life from ‘C’ to ‘A’s. Wow, I couldnt thank you even more for what you did. Thank You George for all your Tips. I used to get D’s and C’s, but since I bought your Programme now I am getting consecutive B’s and even A’s. 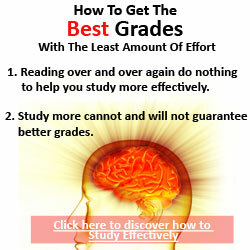 © 2009 How To Study Effectively & How To Get Good Grades. All Rights Reserved.